Grey mists that hung over Loch Arkaig – a portend for the day? The road to Strathan was as tortuous as ever, the sinuous way famous for its gut churning effects. I was in the back of the car – John and Caroline in the front. The Dark Mile was gloomy, tempered only by the frost that clung to the mosses. The numbered sites of the holiday caravan pitches were empty, awaiting the promise of spring. The Loch was flat as if burdened by the weight of the gloom hanging over it – not a ripple to be seen. A group of stags watched hopefully as we crawled by. The road was not gritted after the final houses. John proceeded with utmost care, the iced weeps of water presenting hazards at every turn, and there were a lot of turns. At least the speed meant that it was as comfortable in the back as in the front. Eventually we reached the road end. We were soon ready to march further into the grey. It was 9.30am. There was no wind. The still damp soon clung to the clothes and wet the hair. It soon became apparent that we were overdressed with three layers but we carried on. Just before Glendessary House we turned right to pick up the path that leads over the pass to Glen Kingie. We passed a couple of targets for the shooters, including one in the shape of a wild boar. Shooting wild boar is one of the activities offered by the Estate here to diversify its income as the activity is available beyond the traditional stalking season. We stopped for a bite to eat perhaps 50 vertical metres below where the path levels off as its reaches the beginnings of the pass. It remained still but overhead there was a blue tinge in the cloud. Oh my! And the bogs across the pass were frozen. I have been this way a few times and never have I had it so easy. as was the outlier I was aiming for, Sgurr an Fhuarain. I say “I” because John and Caroline’s objective was Sgurr Mor. 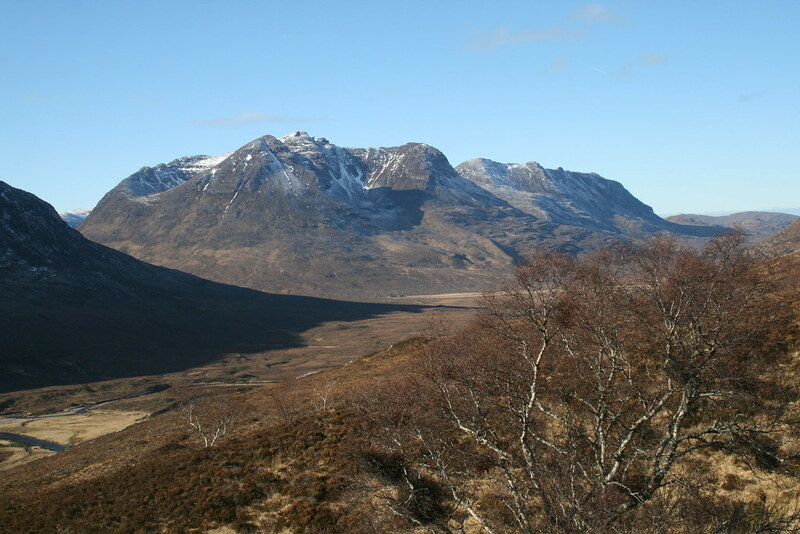 The SMC Corbetts book suggests that Sgurr an Fhuarain is most often done in combination with Sgurr Mor or Gairich. Well, not in my case! We parted ways at a knoll overlooking Glen Kingie after another brief stop for food. They contoured around to the west to pick up the stalker’s path at the head of the Glen. I descended towards the river in the Glen. They were going to do the optional Walkhighlands return route as the route of ascent up and over Sgurr Beag to Sgurr Mor, and then to the bealach I would be aiming for as their descent route. The air was so still I could hear their chatter for 10 minutes after we split. The hillside down to the river remained in the grip of a deep freeze with the sun barely touching that aspect. Although the river was making a lot of noise, it was by no means in spate. The risk in crossing was stepping on a rock that was covered in a thin layer of ice. The crossing safely negotiated there is a short stretch of gentle incline before the brutal ascent. And it is brutal, relentless, a wall of grass. Teeth gritted I started up. I passed the site of small landslip and then I trended slightly to the right (east), aiming to reach the ridge above its low point. I avoided patches of snow so far as possible. The views up and down the Glen opened up. It took just about an hour to reach the bealach. From here the Ben peaked around the side of Fraoch Bheinn. Sgurr Mor and Sgurr Beag towered above. 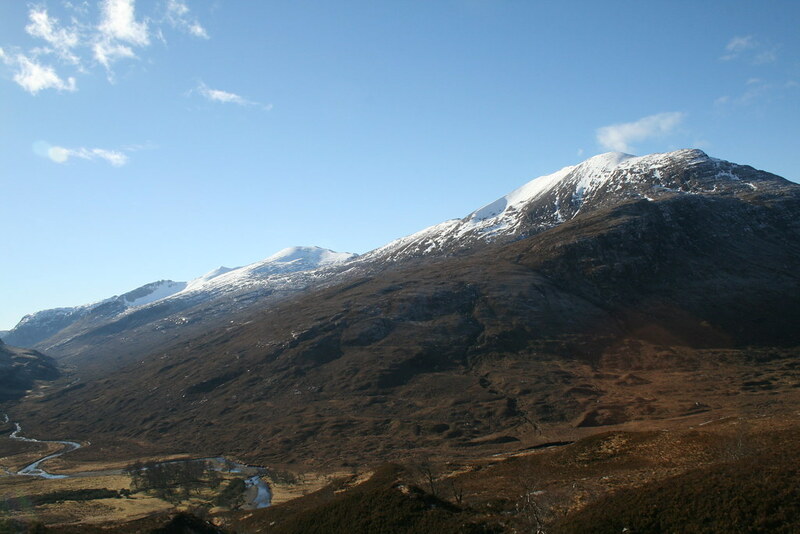 A surprisingly snowless Beinn Sgritheall and Sgurr a’Choire-bheithe lay to the north of west. 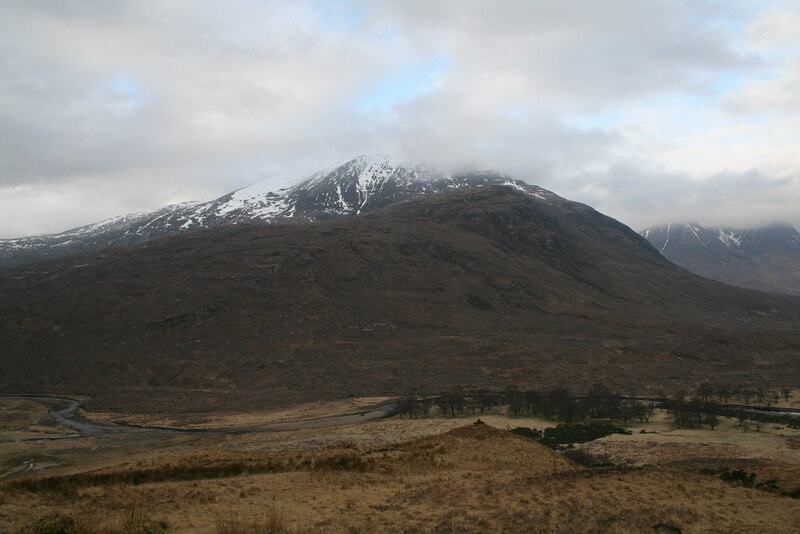 The Saddle and the South Glen Shiel ridge were further north still. I quickly put on a couple more layers, layers that had been stripped off on the climb. The breeze was missing just a few metres lower but had teeth. It was not too strong but it let you know it was there. I turned east. The well defined ridge rose ahead. Patches of firm snow aided the pace, only becoming a little awkward where the gradient occasionally increased. Barely 20 minutes saw the summit achieved. The pictures speak for themselves. It was not the breeze that took my breath away. The phone buzzed – a missed call. Reception on the high tops, silence below. It was Sue. She was suffering from a cold so had not ventured out today. She was at the Commando Memorial. I rang her back and described the view. Whilst doing that I also looked for John and Caroline. But despite the clarity I could see no black specks on the ridges around the Sgurrs. The spike of Sgurr na Ciche was prominent, plus the Knoydart Munros. I just looked around and around and around. I was almost dizzy. Do these days satisfy the thirst for being up on high? No, of course not. They leave you wanting more. A paradox? Greed? Lust? Oh yes, I’ll have more of these thank you very much. A lot more – a glutton! Poor Sue. I turned her green with envy. I drank in the vistas. All good things must come to an end and reluctantly I tore myself away from the summit. I romped down the slopes to the bealach using the snow slopes that had softened a little in the sun. It took me all of 5 minutes. What a buzz! 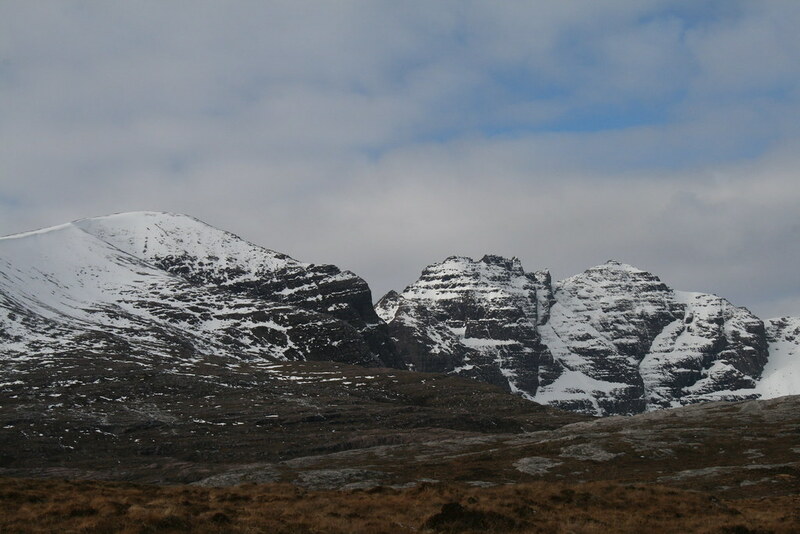 From the bealach I found a few more snow runnels and zoomed down these. Too fast, too fast. There was no point in rushing. John and Caroline would be behind me. So part way down the hillside I stopped for a late lunch. Back out of the breeze I was able to sunbathe and close my eyes. I slowly ate and drank. I was level with the pass over which I had come and over which I would return. Due to the frozen bogs I was quite looking forward to the return. Sgurr Thuilm and Streap stood out against the blue. I wondered how John and Caroline were getting on. I half expected to hear their voices drifting across the stillness. There was some warmth in the late February sun. I closed my eyes again. Eventually I roused myself from my sloth and continued down and down. The river was easily crossed again, at a different point, and I was back in the icy grip of the north facing slope. The occasional crunch of ice brought me to the pass proper. Although I did find perhaps the one piece of unfrozen bog, the pass was safely navigated. I cast an eye back from time to time to see if John and Caroline might be spied, but no. 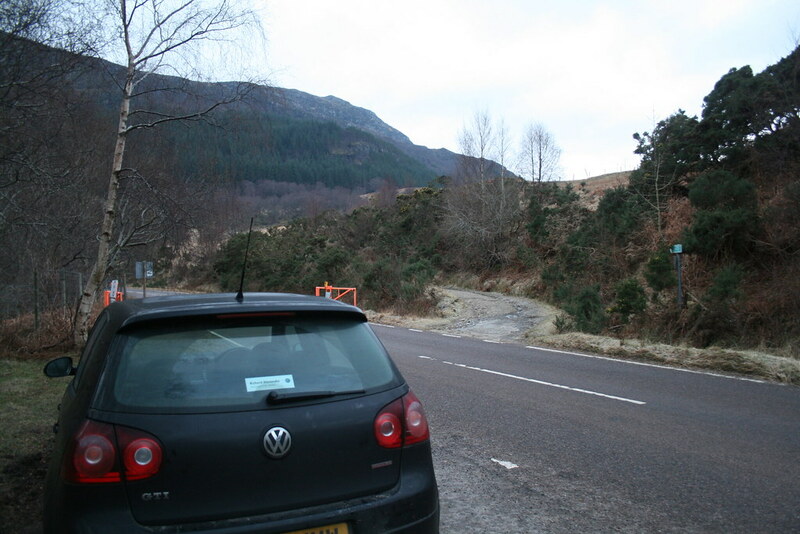 I re-entered Glen Dessary. The sun was starting to set. The soft outline of Gulvain appeared. It was just before 5pm. I was soon down to the boar. The hum of a generator sounded from by the cottage. I joined the track and was back to John’s car within 30 minutes. He had hidden the car key, which I retrieved, and I changed out of my boots and stowed my kit. I was quite weary, even though I had not pushed myself that much. I settled myself down to wait for the others. The sun went down. Sgurr Thuilm and Streap were silhouetted against the sky and the moon rose. They arrived at just after 7pm, just as I was starting to become cold. Getting to the base of Sgurr Beag had taken them longer than anticipated. Whilst the zig zags of the stalker’s path made for easy going, they sweep wide to and fro across the hillside. Then the descent off Sgurr Beag had been rock hard nevé requiring crampons and care. So it was back slowly along the road into the night. Ice shimmers blue in the morning light. Who’d want to be in any other place? Mountain and I never apart. Crystal shower bathes my face. Carry on to the end of the day. Breeze blows gently through my hair. One more push lifts me to the sky. In the mountains for evermore. An outing with 6 of us. Two cars taken and we parked up by some buildings next to the road at Achnasual. We were not prompt, it was around 11.00am when we set off. The objective was just Geal Charn. I had done Meall na h-Eilde many years ago from the north via the forest tracks that make this group accessible also from that direction. We walked down the road to where a wet, boggy track lead up to a small communications mast and followed the track over a side stream and out to open slopes. 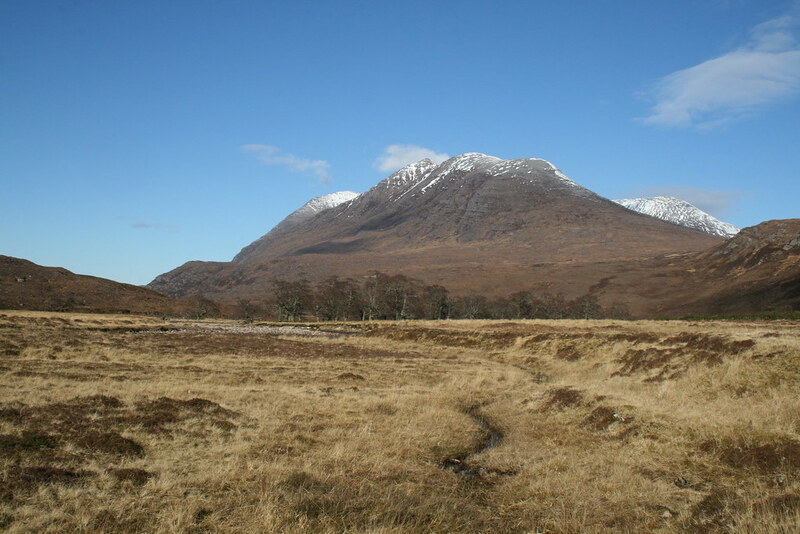 The track became a path, the views opened up over Loch Arkaig and back to Beinn Bhan. The path continued strongly if crossed regularly by ice where snow melt had refrozen – so concentration was in order to prevent an unwelcome slip. 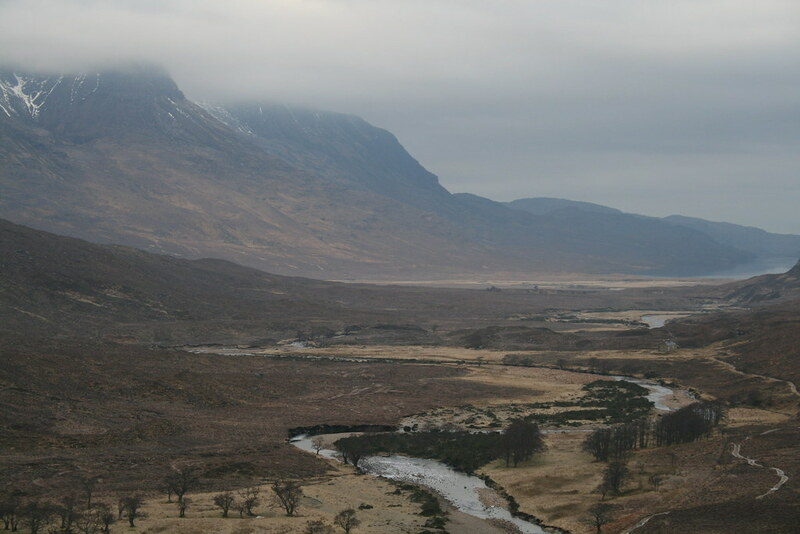 The glen of the Allt Dubh narrowed. We stopped for lunch in the shelter of a small cutting created by a side stream at around 12.30pm. 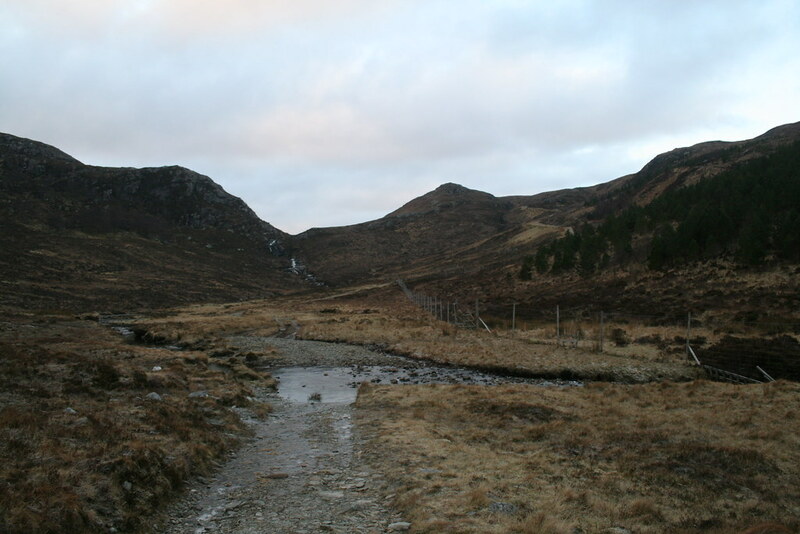 We continued until the path petered out at the head of the glen and then struck off to the left. We found a snowy run to follow, but where the ground steepened we left it. Looking east we could see the pronounced “U” of the col between the Loch Lochy munros. Eventually the slopes eased for a while before the final rise. Here large firm snow patches made for easy progress. Two of the group reached the summit first. I followed on a few minutes later arriving at about 2.10pm. The stragglers arrived 15 minutes or so later. The views from the summit are expansive. 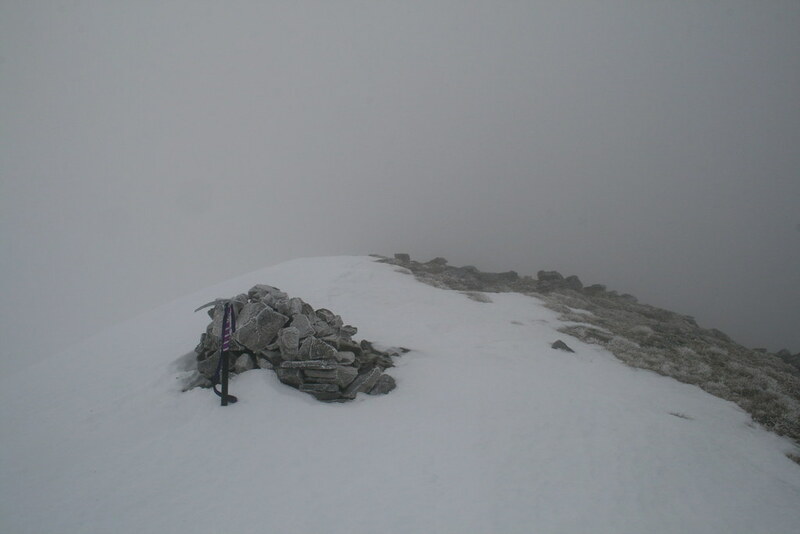 The Ben Nevis area was covered in cloud. as was poor Sron a’Gharbh Coire. But to the north and west the views were extensive. We did not leave the top until 2.55pm. The descent was uneventful. Two of the group sped off ahead as they were due to attend the Banff film festival showing in Fort William. The evening set in and we were back at the car by 4.45pm. A nice easy day with views that more than reward the effort. 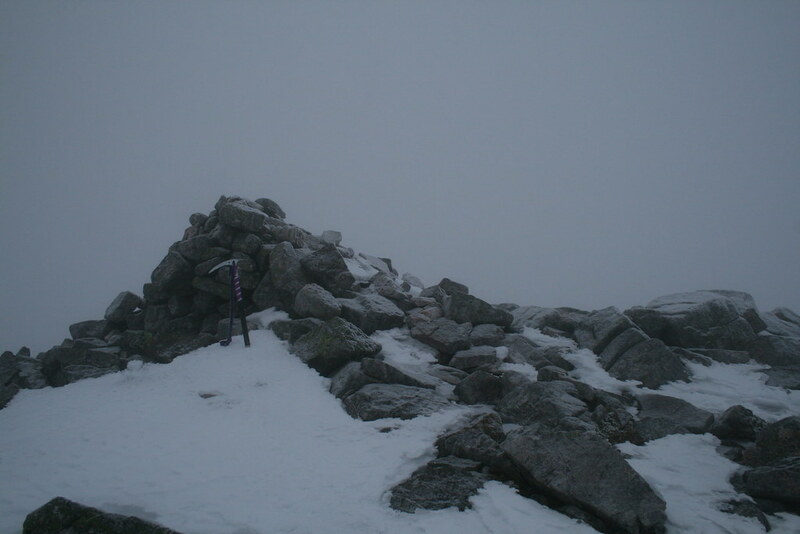 The MWIS forecast was for a 90% chance of cloud free summits. Driving up the A9 north of Dalwhinnie the clouds broke up, stars sparkled in the sky and the temperature dropped a few degrees. The temperature rose a little around Inverness – presumably under the influence of the sea. It was late and so I sought out a suitable spot to park and kip for the night. This I found just north of Garve (Ben Wyvis car park). I settled down for the night. Even in the sleeping bag I woke with the cold from time to time. Eventually I gave up on sleep around 6am and had some breakfast. The sky was not what I expected, nor what the previous evening had promised. But perhaps the cloud might burn off – a thought born of hope over experience perhaps. Unlikely to happen in a frigid Scottish winter. I arrived at Corrie Hallie around 7am. There were no other cars there. I faffed around making final preparations and then set off around 7.25am. The track in to Achneigie rose gently and soon swung to the right to a gate where a sign implored you to report any fishing being undertaken beyond, with a phone number for contact. The track continued its gentle rise up through the woodland. 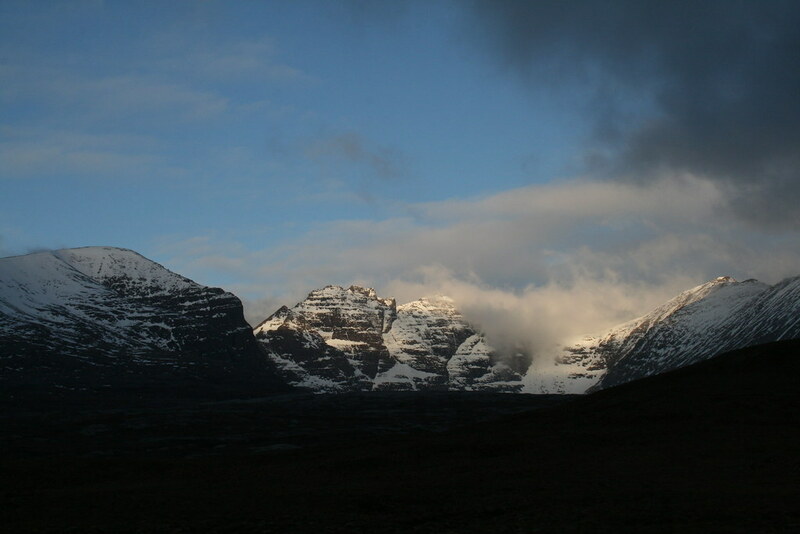 An Teallach had come into view early on. 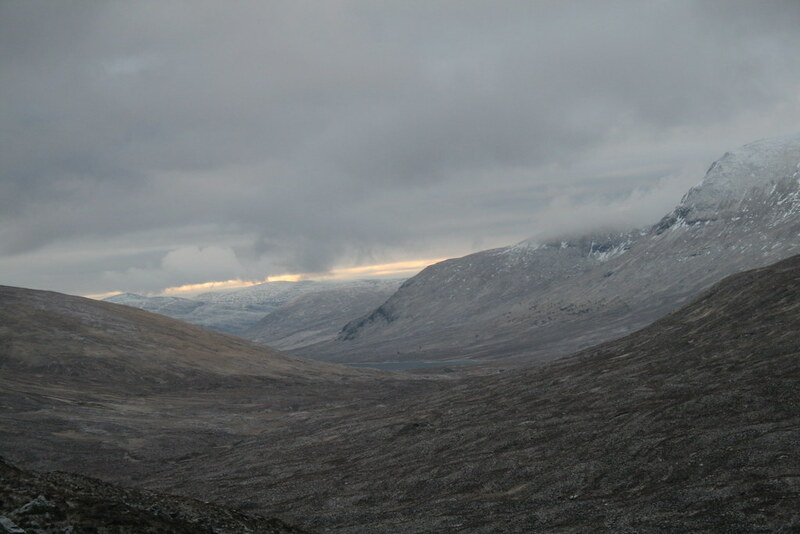 The cloud was boiling up in the coire and some blue sky did appear. The pinnacles were visible but the main summits remained swathed in the cloud. The track exits the woodland and eventually leads to a ford with the option of a footbridge a couple of hundred metres beyond. The path to the footbridge might be quite boggy in certain conditions, but today it was solid with footprints frozen into the dark soil. The track then zig zags up on the higher moorland. 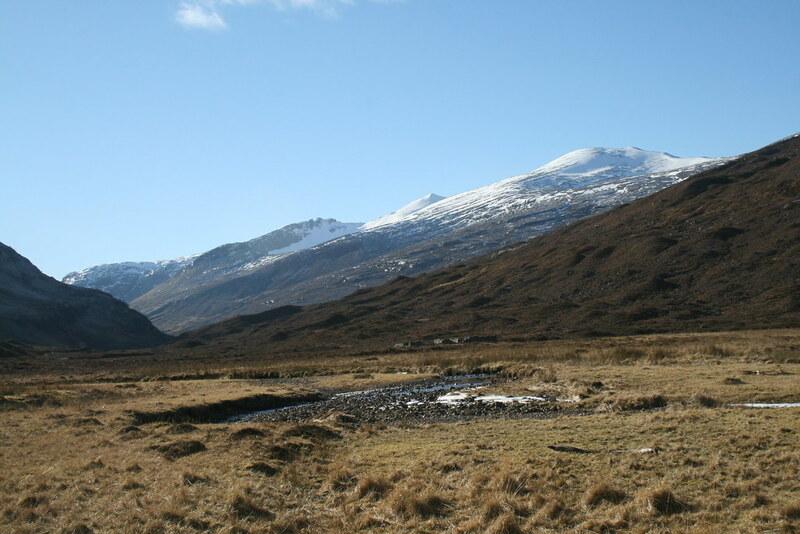 A large cairn appears and shortly after then a smaller cairn that indicates the route across the lower slopes of Sail Liath and on to Shenavall. I continued on the track which winds its way for 3k over the bleak moors. Frozen lochs lay to the left. The clouds were thickening. Although it was a little cold, the forecast was right with the wind – it was light. 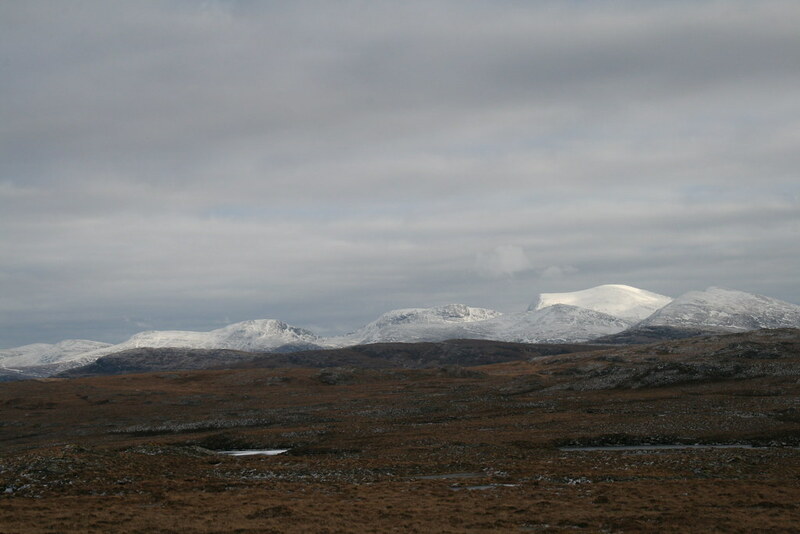 The Fannaichs to the south were covered and the Beinn Dearg group was invisible, as was Beinn Dearg Mor. The track then swings south on its initial descent into Strath na Sealga. 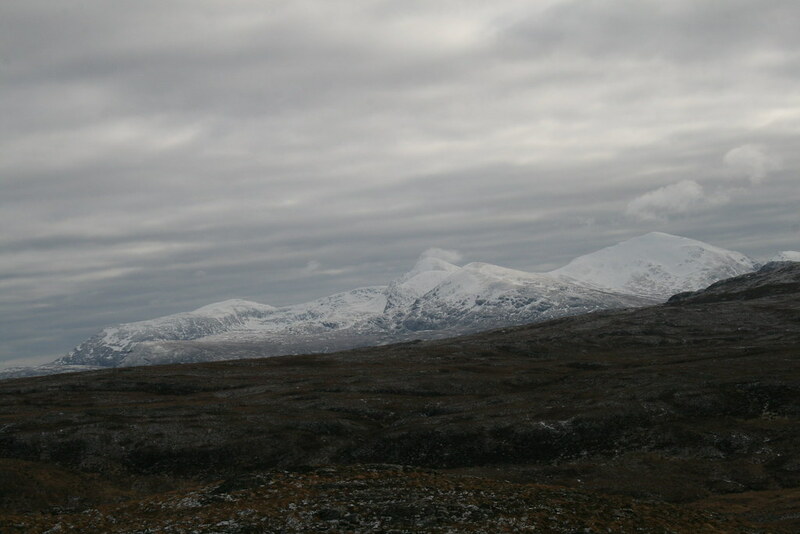 From here the slopes up Beinn a’Chlaidheimh could be inspected. The valley floor soon came. The track turns right towards Achneigie beyond some alder woodland. At this point I continued over grassy terrain to the river that had to be forded. The river was not running high but I was put off by the lack of rocks and the icy crusting that was covering many that were exposed. So I went a couple of hundred metres downstream where there were banks of shingle. Other than a narrow deeper channel on the far side with a large rock in its middle, the crossing was straightforward. The way now steepened up a broad heathery slope broken with some rocks. Although the ground was largely frozen, the gurgle of many streams could be heard and some of the ground was soft. The initial slope was soon over and the gradient eases on the westward turn towards Beinn a’Chlaidheimh’s north ridge along the top of the crags of Creag Ghlas. Frustratingly I was caught up a bit in some rocky terrain that crossed the slopes. I needed three attempts to find a way through. Carrying my big pack this tired me unnecessarily. The continuous snow line was then met and it also started to snow – again so much for the MWIS forecast – miniature rice shaped pellets, not much but noticeable. Whilst the rocks remained, crampons were not necessary. But soon the combination of gradient and firmness of snow meant that crampons had to be donned. I took the opportunity to have something more substantial to eat. The cloud was not clearing. I met the cloud and shortly after then the north ridge. I still had 100m of ascent and 1k to the top. A further steepening followed and the narrow summit ridge was reached. The conditions were pleasant enough – shame about the lack of view. The summit is the third of three tops. I took a photo but otherwise did not stay long. It was 12.50pm – 5 hours 20 minutes from my start. On the southern slopes, the snow soon stopped melted by previous days of sun. Crampons came off. 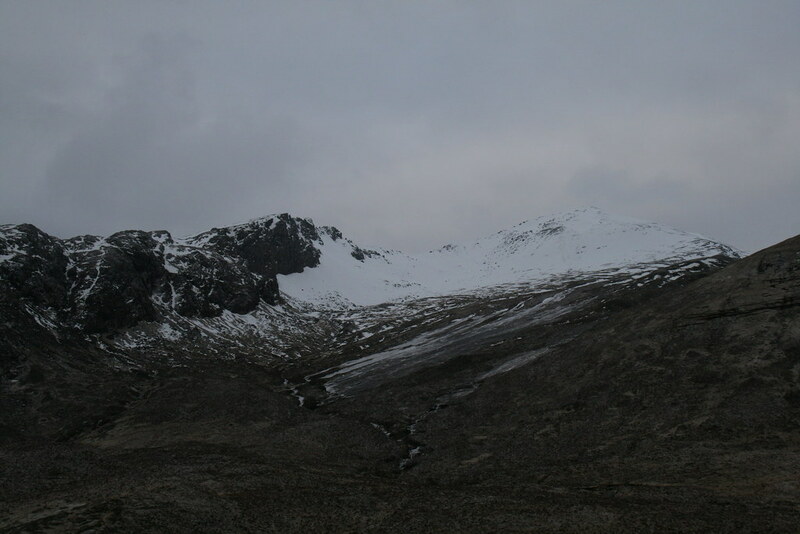 A brief ascent is made over point 815 before a longer descent to the col beneath Sgurr Ban. The loch on the col was well frozen. The colours were monochrome. I was level with the cloud base, but only just and there were certainly no views. 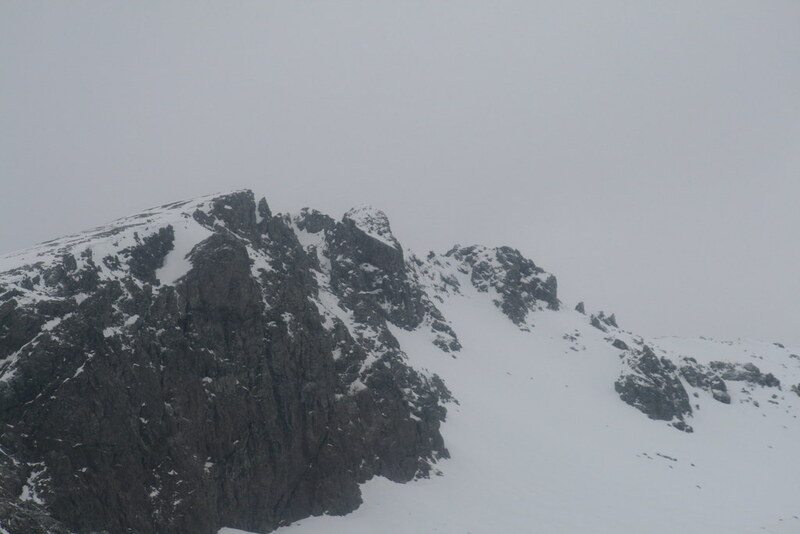 The broad bouldery slopes of Sgurr Ban rose back up into the gloom. They were so broad that I took a precautionary bearing. The snow was deep enough to create wide corridors between the boulders. Crampons were put on again after a further stop for food. There is a 340m ascent from the col. It seemed to go on for ever! But the surface was as good as you would want. Part way up a cairn and shelter was passed but I did not stop to investigate. 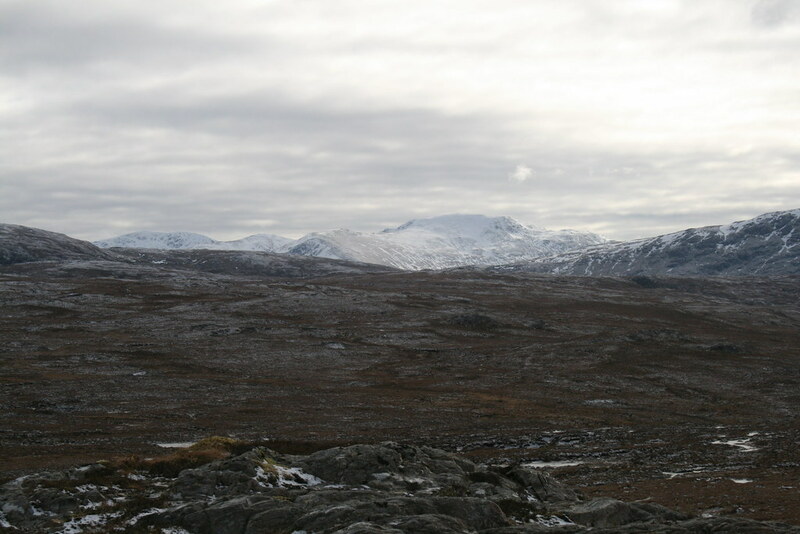 The summit of Sgurr Ban is a large plateau. The sizeable cairn lies in the south east quarter. I arrived there at 3.10pm. 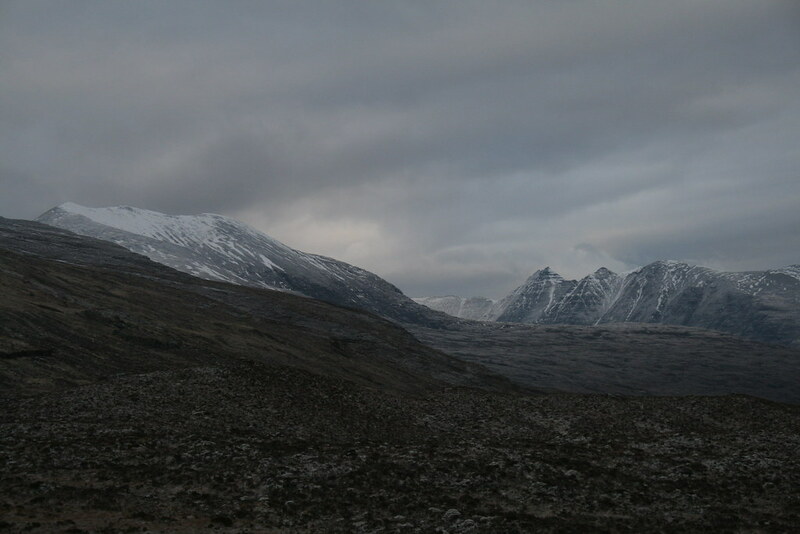 Again I stopped long enough just to take a photo of the grey swirl with cairn and ice axe. A further bearing was taken to check the way off. This summit being higher, the snow on the southern slopes remained. I could only have been 30m from the col. The angle of the terrain was low almost but not quite level. Then it happened. I felt the tip of my right crampon catch. Instantly I was being thrown forward. Instinctively I threw my ice axe to one side. As I fell I could see the red Torridonian sandstone rock that my head was going to hit. A certain momentum was created by the heavy weight of the pack on my back. That momentum was not going to be stopped. I pulled my chin down so that my face would not have the impact. Although my arms were out and no doubt softened the blow, the top of my head cracked against the rock. I was not stunned and I managed to pull myself on to my knees quite quickly. A trickle of blood dribbled into my right eyebrow. With the weight still on my back I staggered on to my feet reckoning that the effect of gravity would be more beneficial with me totally upright. The blood was now flowing at some rate. I pulled off my hat. It was the only thing I could use to apply compression to the wound. I also removed my gloves and dropped them on the ground. Head wounds are, of course, known for their propensity to bleed. This one was no exception. A slow stream ran down my nose and formed a drip on its end. Another ran over my right eyelid. Gradually the flow abated and I felt brave enough to release the pressure on the scalp. A small spattering of red had marked the snow around my feet. For want of anything better and to soak up any remaining blood (and there was more) I put my hat back on. Gathering up some snow I cleaned my hands and, as best I could, my face. A finger on my left hand was sore – there was a slight graze by the finger nail but I had also hurt a joint. I wriggled it to make sure it was not broken. Descents from the col here are tricky. To the west any descent would be dangerous; to the east there is an extensive area of slabs to be avoided, at least in these conditions. I did not consider a return up and over Sgurr Ban. As anyone who has done this route will know, the initial slope up Mullach Coire Mhic Fhearchair is steep – perhaps 50 degrees steep. Being north facing it was covered with snow with some rocks poking through on the steeper sections. That snow was extremely hard and it was difficult to get more than four crampon points on each foot into the snow. So it was a slightly nerve wracking ascent until the slope eased off dashing from rocky outcrop to the next so as to obtain some sanctuary whilst my breath came back. 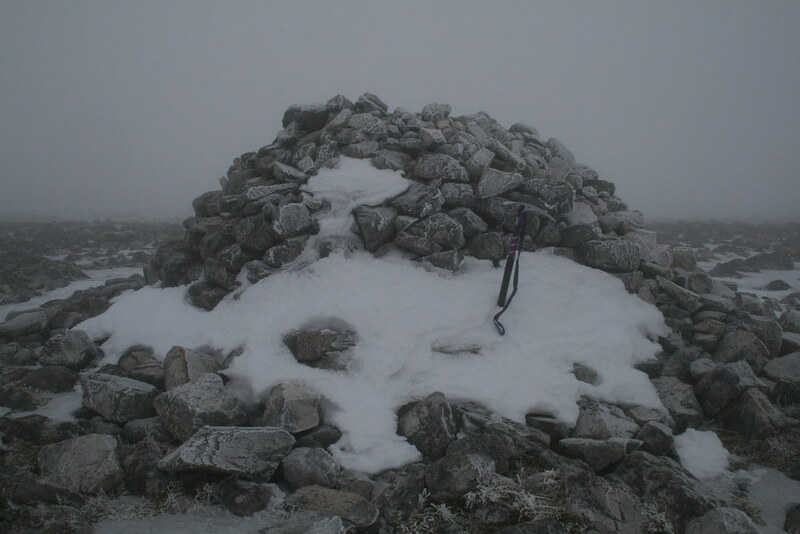 Once the slope did ease it did not seem to take long to reach the summit cairn. It was 4.35pm. I stopped to have more food and to compose myself. Perhaps surprisingly my head was not sore. My original intention had been to follow the Mullach’s south east ridge to the far Munro top and then re-ascend the Mullach and carry on to Beinn Tarsuinn. But with sunset a little more than an hour away that would not be feasible. So I had a choice of carrying on in the direction of Beinn Tarsuinn with the possibility of walking north up Gleann na Muice or continuing with my original plan to go to the far top but not return, instead descending east to pick up the right of way between Kinlochewe and Corrie Hallie. In either event I would be bivvying out. At least I was carrying gear that would enable me to survive a night out on the side of a mountain in the middle of a Scottish winter. I chose to follow the south east ridge which has two tops I had not previously done. So at 4.50pm I set off. The ridge to the first top was a delightful stroll with not much of a re-ascent. The continuation is then south south east and the ridge narrows and became rockier. 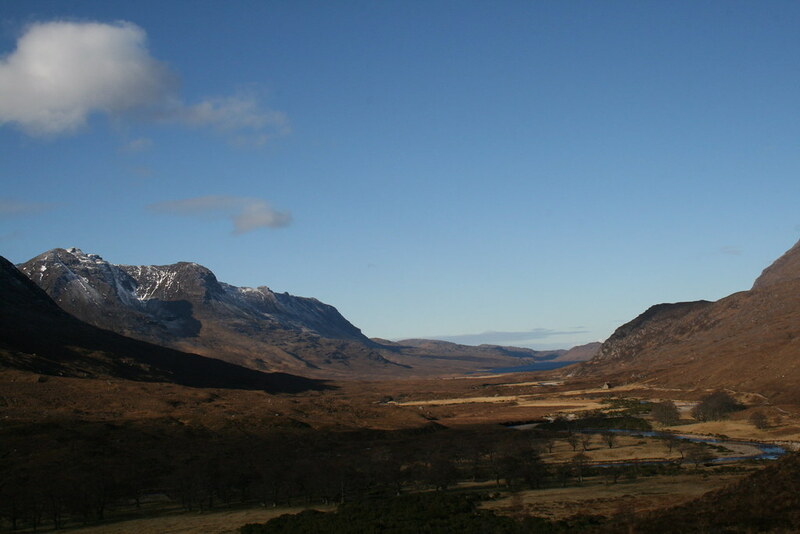 Whilst the snow held fast on the north east side of the ridge, the south west side had little. So I had to take off crampons. 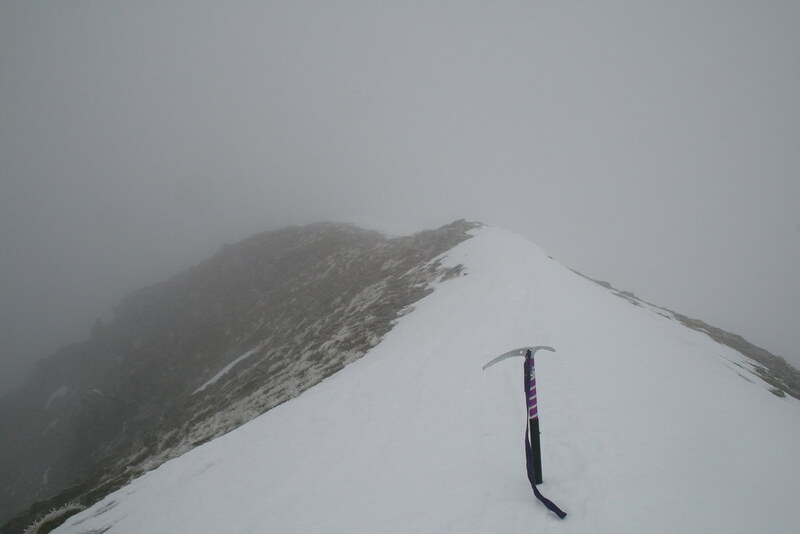 Whilst I had read guides on this ridge – which described this section as an easy scramble – under winter conditions it became a lot more serious. There is a rocky descent followed by a series of pinnacles. No doubt this is fun in summer but it required a lot of care in these conditions. Although a snow free route could generally be found the rock was a little greasy in the cloud and there was enough loose stuff to be aware of. I ascended the penultimate pinnacle and to my horror the continuation appeared to comprise a narrow snow arête. Fortunately on further inspection (other than a short section across the little saddle between the two pinnacles) it was possible to pass along the south west side of the ridge free from snow. A rather unorthodox technique saw me across the saddle and the climb to the final pinnacle (which was the top, Sgurr Dubh) was uneventful. Phew! It was now 5.45pm. From there there is first a short loose descent and then the slopes down broaden out. To the north are cliffs and at the eastern end of this area there are more cliffs. The map shows yet more cliffs to the west and part of the south. So I went about 1k eastwards and then turned due south to find the (wide) break on the ring of cliffs. The initial slopes were a delight. Had I been able to see any distance I would probably have been able to run down them. But I had had enough adventures for the day. So I steadily followed my courses. On turning south, the ground soon drops away into a typical mix of steep grass and heather interspersed with craglets. Here snow melt had also refrozen into sheet ice. The light from my headtorch was not going safely to guide me down this ground. I decided to settle down for the night. The cloud was swirling around but at least it had stopped snowing and the wind was almost non-existent. It was easy to find somewhere relatively level and the ground was not going to be wet. I laid out my sleeping mat and sleeping bag before throwing my bothy bag over them. I then stuffed my rucksack at one end so as to create a little room for my head. Other items were placed either side of the sleeping mat under the cover. 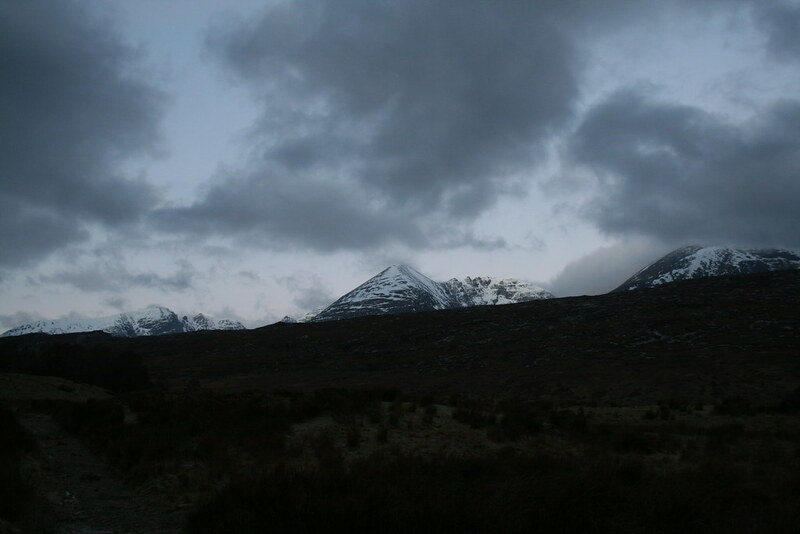 Boots were taken off and I crawled into my cocoon for the night, tucking the bothy bag under the mat and the rucksack. An old style orange survival bag was put over the sleeping bag to stop condensation from seeping into it. It was just before 7pm. I slept relatively well, if broken. I woke up a few times shivering or when drops of cold condensation fell on my face. But I was soon back to sleep on each occasion. Once or twice I heard snow landing on the bothy bag. By the morning there was a light covering. I decided to get up at 7.30am. I was surprisingly well rested. The cloud had lifted a little and I could see the valley below. 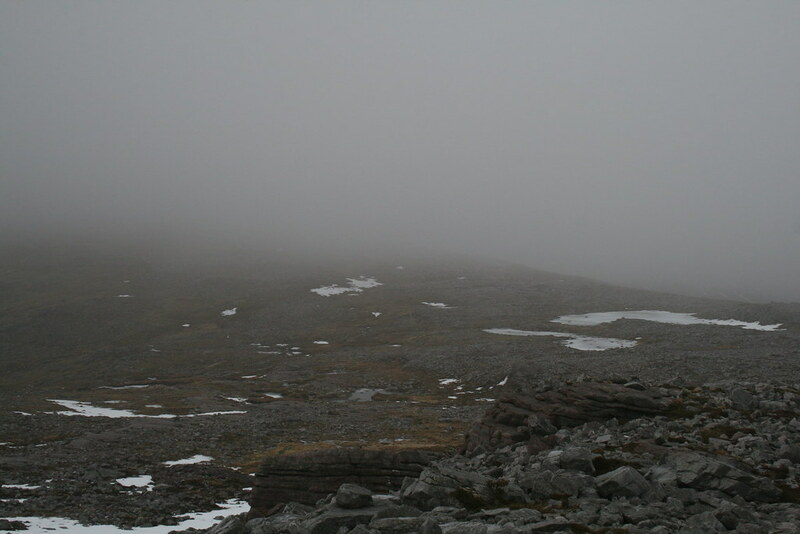 A wall of cloud was held back at the Bealach na Croise. Whilst chomping at some food I packed up. I left my spot for the night at around 8.00am. The terrain below me was not in fact that bad. Part way down I took a photo of Loch a’Bhraoin. I was pleased also to see a path, not marked on the 1:50,000 OS map. It was quite a good one, the right of way to Kinlochewe. A fox had passed by going the opposite direction its tracks quite clear. 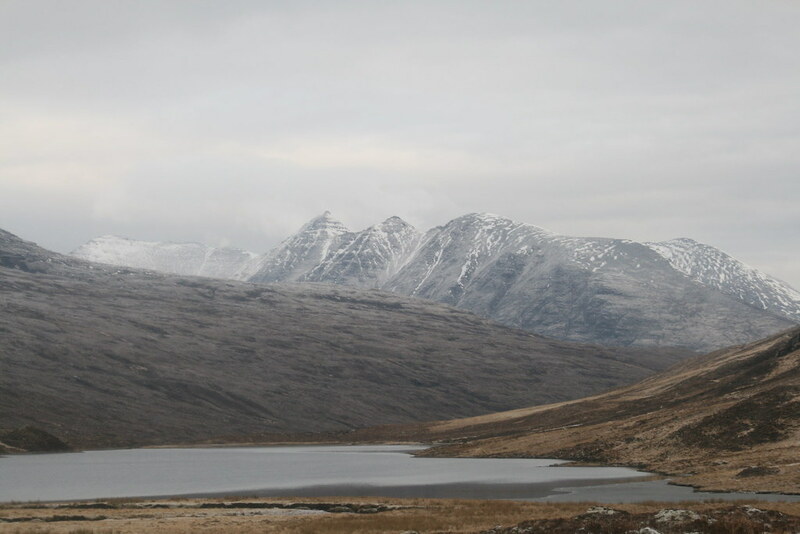 The path soon swung north towards Lochan an Nid and An Teallach came into view, its summits clear but under a grey sky. Beinn a’Chlaidheimh was also, annoyingly, clear. Approaching Lochan an Nid I was able to look back up at Mullach Coire Mhic Fhearchair. 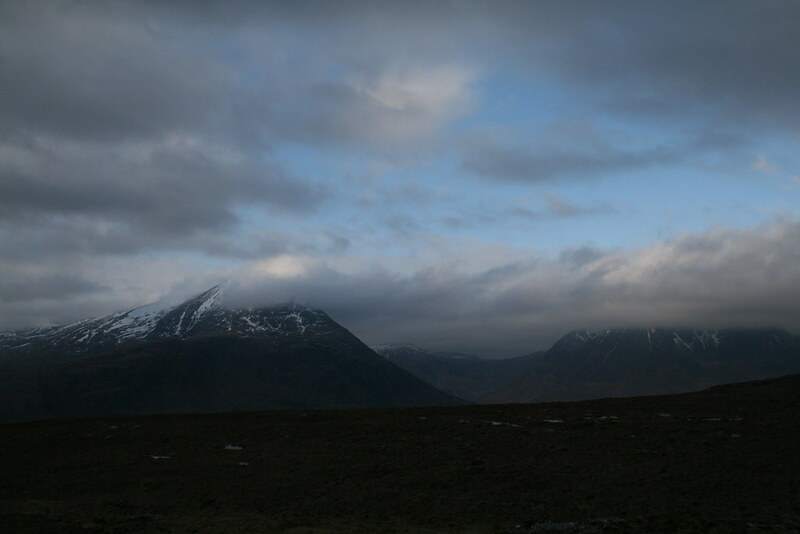 Only the south east top and Sgurr Dubh were visible. Crossing the inlet to the loch was straightforward and I joined the path coming over from Loch a’Bhraoin which had been in view for a while. I was able to take a zoomed shot of the spiky ridge of Sgurr Dubh. I continued on past Lochan an Nid with the sky becoming lighter. The path continued down into the wider strath where ruined buildings littered the valley floor past a few narrow rocky cuttings where the waters of Abhainn Loch an Nid crashed through. Here in the valley bottom the ground was quite wet but crossing the river flowing off the side of Am Fireach was easy enough. I then stopped for a proper breakfast on a dry bank just beyond. It was around 11.30am. By now the clouds were lifting and breaking. As the pot bubbled away I took in the views. I had a pleasant 40 minutes in the sun. There was a little warmth in the sun but the chill in the air dominated. Having had my sustenance I washed the pot and packed up. There was now a greater spring in my step. I eased back up the track that I had come down just over 24 hours earlier. On a couple of occasions I stopped to take in further views. The walk across the moorland was a nice stroll albeit the breeze was still chilly. Other than looking at the views that opened out to the south and east, I considered what I was going to do with my hat. I had not taken it off since the “incident”. The hat was stuck to me at the front, the dried blood providing an effective glue, though it would lift off at the back. I was keen to ensure that I did not reopen the wound. So I gently fiddled with it much of the way, gradually easing it off. Oh yes, still looking at those views. The descent back through the woodland to Corrie Hallie was a delight. I even spotted a family of three goats but I was not quick enough to photograph them. I was back at the car by 1.30pm, to inspect the damage. It was not a pretty sight. I was glad that I had not passed anyone on the return as my attempts to clean myself up had not been too successful. So I washed my face at least to get rid of the residual blood there. I had a spare hat in the car which would do for covering up the main gash until I reached the self-catering accommodation that I was to stay in for the following three nights and could sort myself out. I seemed to have three points where the skin had broken. Writing this a couple of weeks later two of them have healed up well with no lasting damage. As for the third, well I will wait and see. So how do I feel about the “incident”. Well I am upset about the silly mistake and the possible long term damage. It might have been more serious but, on the other hand, it may well not have happened on more difficult ground because my concentration levels would probably have been greater. I do not know how it happened (i.e. why the crampon caught) – obviously a momentary lapse but why? I do not recall being less vigilant when it happened. In the aftermath I reacted quickly and as best I could in the circumstances. Being by myself did not matter as it happened, but would have done had I really hurt myself. I had left details of my route (which I was still on at the time) but no-one would have happened by (probably) for some while if I had been incapacitated. I was unlucky in that I could instead have tipped forward onto (hard) snow when, presumably, the damage would have been less. It just goes to show that it can happen to anyone, anywhere, at any time.